We are reckoned as one of the prime Manufacturers, Exporters and Suppliers of Rubber Support Insert. 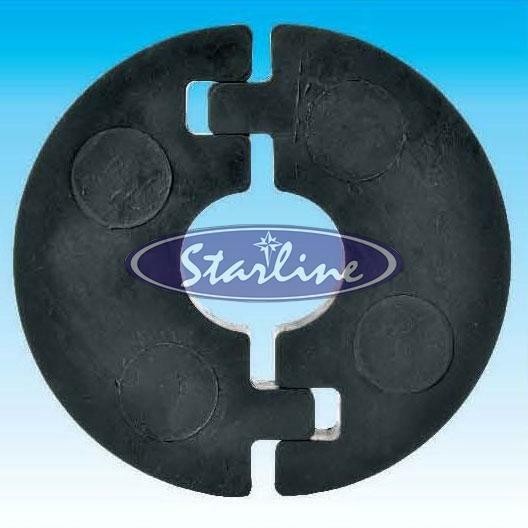 Our Rubber Support Insert is an effective means of preventing crushing of insulation at pipe support points of chilled water, condenser water and domestic hot / cold water installation. Dimensional accuracy, rigid construction, low installation cost and exceptional durability are the prime attributes of our Rubber Support Insert. Also, the insert is resistant to corrosion, water and weather impact. We make available Rubber Support Insert in numerous pipe sizes and insulation thicknesses for diverse applications. Product is extremely rigid. Hence resistant to deterioration over a period of time. Unlike wood, material is non corrosive. Lower installation cost due to lack of requirement of additional metal sheets for wider load distribution. Tongue and groove arrangement between RSI inserts saves labour cost and time. Rubber pipe supports also provide an acoustic barrier against transmission of high frequencies. Rubber support inserts are available for all pipe size and insulation thickness and are intergrated with our various type of pipe supports to ensure fast and quality pipe installation. Nominal Pipe size, Pipe OD and insulation thickness.